MOSCOW (Sputnik) - French President Emmanuel Macron has condemned violence at the eighth weekend of the "yellow vest" protests and stressed the need for discussion and dialogue. "Once again, an extreme violence came to attack the Republic… Those who commit these acts have forgotten the essence of our civil pact. Justice will prevail. Everyone must pull themselves together to bring about discussion and dialogue," Macron said on Twitter. The wave of the so-called yellow vest protests — named after the obligatory attribute of French drivers — started in mid-November. While the French government has scrapped its planned hike in diesel taxes, which is what initially sparked the protests, the "yellow vest" demonstrations have evolved into a broader movement against government policies and rising living costs. The rallies have been marked by violent clashes between protesters and the police. At least 50,000 people across France continued on Saturday to keep up pressure on the government, according to local media. 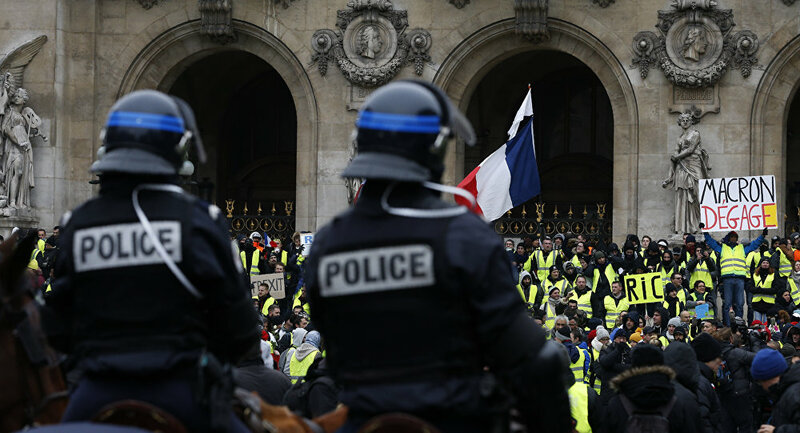 In Paris, government spokesman Benjamin Griveaux was evacuated from his office after a group of protesters forced their way into the ministry, French media reported.